All the thoughts which come to your mind and haunt you are just thoughts and they should have no effect on your actions. 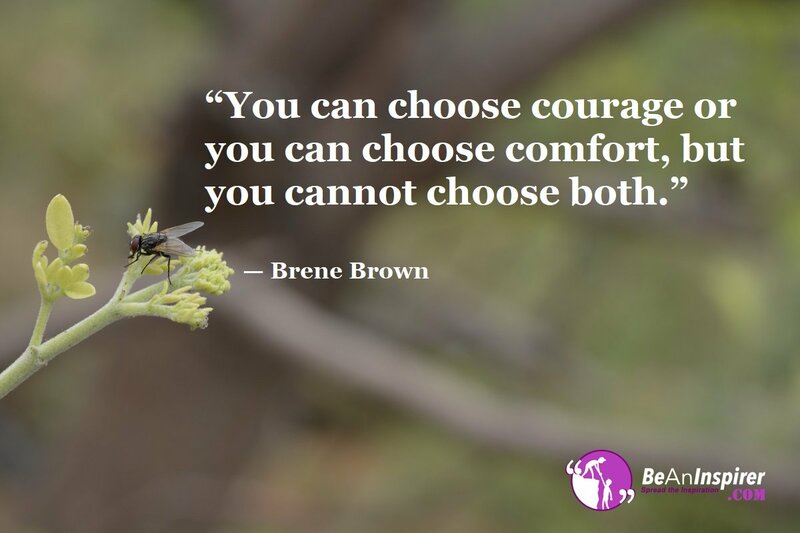 Your actions will decide whether you have the courage to do something or not. You should walk on the path of achieving the goals with courage in your heart. Imagine having to get everything from your parents and having no dream or aim of your life! Would that life be meaningful, No right? It’s the passion of achieving your dreams without any fear leads you towards your goal and makes a satisfactory life. The most important thing which you will need to do for being successful in your life is gathering courage for accepting the mistakes done by you. If you don’t have the courage to accept your mistakes, then you will hesitate in improving yourselves in future. So, make sure that you forget about the results and tell the truth. Sand up for the blunders you have done in your life and fear not in accepting those. This will make you a bigger person. For growing up to the level of your favorite human being, you will need to know about your positive points and strengths. The positivity level of your heart and mind will enable you to go towards your goals with courage. Being fearless is an art from which you should not keep yourselves away. Even the little courage can help you in jumping over the hurdles of your life. All the time of suffering and pain will go away only if you will follow your goals with courage. There is not a single person who is talentless and you also have got some talent which can help you in reaching towards your dreams. Sometimes, it might not be possible to reach the goals because of a lot of difficulties in life but the first thing which you will need to do in that case is to accept your mistakes which will help you to be honest towards yourself. There are different ways to testing courage according to the opinion of different people in the world but the only way with the help of which you can decide if the person is courageous or not is by checking the level of happiness in his/her life. That curve (smile) on the face should be consistent with both the pain and gain and this decides if the person is able to live his life without any fear or not.